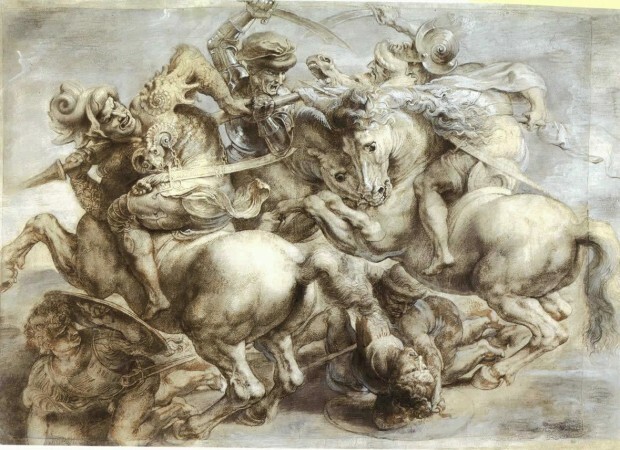 da Vinci’s Battle of Anghiari Found? Researchers think they may have found the missing Battle of Anghiari painting by Leonardo da Vinci. As the story goes da Vinci was commissioned to paint a fresco on a wall of the Florence’s city hall. The experimental technique he used failed and he stopped. Others say it was completed, starting part of the mystery. Years later, Giorgio Vasari was ordered to renovate and paint a new fresco, “The Battle of Marciano”. What happened next is subject to debate. Some believe he painted right over da Vinci’s work. Others believe he built a new wall just a few centimeters in front of the old wall to preserve da Vinci’s work. Supporting this theory is research that found at one point “The Battle of Marciano” contained a tiny green flag containing the phrase “Cerca, trova — seek and you shall find”. Perhaps a hint? They have now went as far as inserting tiny cameras in a few holes in search of the original work. They found there was indeed an airgap as earlier x-rays indicated. They also found materials that da Vinci was known to use in paint. Of course an existing work would likely need to be destroyed to expose this hidden work, unless new techniques were created to remove the newer wall, extract da Vinci’s work and replace the newer wall. File this one under “amazing”. It is not necessary to destroy the Vasary fresco. The transfer to canvas of a fresco is a known practice since the 18.th century and was used many times to save frescos from dissolving walls. But first we need stronger proofs that the Leonardo is there than the results of a private laboratory.